I stopped relaxing my hair almost 3 years ago and for the most part, it's a decision that has made me pretty happy. I really enjoy the versatility of being able to just wash and air dry for a natural wavy look or roller set/silk wrap for a straight look that has TONS of body and movement. Personally, I am over the stick straight look. I probably get my hair flat ironed twice a year and that's for special occasions and for length checks. I do love the fact that when it is completely straight, it's waist length but I don't love how flat it looks. I have embraced the Simba like nature of my hair and I enjoy knowing that when I walk into a room heads turn. So if being natural is so great what is the problem? I literally had the week from HADES!!! It started with an uber demanding client whose excessive neediness cut into my pamper me time causing me to pull the rollers out of my hair before the roots had completely dried. From there, the heat and humidity conspired to turn my hair into one one huge dry puff ball. The only way I could even gt a comb through it was to saturate it with my Deeply Rooted Beauty leave-in conditioner and then seal the ends with the whipped daily moisturizer... and that only served to make it combable(okay that might not really be a word but you know what I mean)...not PRETTY. As if my day wasn't already headed downhill quickly enough, an acquaintance loudly mused about how I planned to sell hair products when my own hair was looking out of control. I pulled it into a bun and just tried to get through the rest of the day without thinking about hair (although normally, my mind is consumed with thoughts of hair) but that night I found myself in the parking lot of a local beauty supply store. I didn't even feel guilty as I scoured the shelves for the "best" relaxer. I got home and sat it on the bathroom counter. All I could think about was how people would have to pull my hair anymore to see how long it is (that cursed shrinkage that comes with being natural) and how when I was having a bad hair day, I could just easily pull it back into a ponytail. 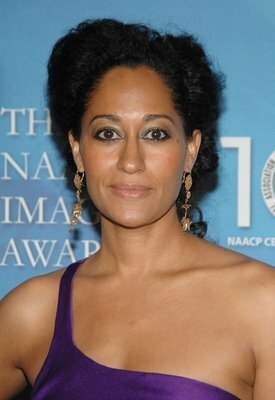 I couldn't relax my hair on an empty stomach and so I sat down to eat and turned on the television and there she was my natural inspiration Tracee Ellis Ross (Joan, from Girlfriends to most of you) . There was a rerun of Girlfriends on as I watched Ms. Ross move from to scene to scene showing off her curly hair one minute and then a coiffed French braid the next, I remembered all of the reasons I love my hair just as it is. I put the relaxer at the back of my bathroom cabinet and then a couple of days later I donated it to a good home. I still believe that a woman should be able to wear her hair how she sees fit but for me, in the place I am right now, that means chemical free. When I really thought about it, I had bad hair days when I was relaxed too. Days when my hair just wouldn't cooperate and I had to pull it back into a ponytail to muddle through. So I don't know why I thought I wouldn't have bad hair days as a natural. I've invested in some really cute accessories and I am practicing my french braid technique so I'll be prepared in case of emergencies. Now if I could just beat down that shrinkage monster, it would be a really great day. I too stopped the madness and have embraced my beautiful God given tresses. I love my natural hair and all things about it. I have even saved enough money from not buying all that comes with that "got to have it straight" bait and have placed it into investments and savings. So listen to wisdom, all you all out there with chemical induced locks, those chemicals are toxic and are making so many women bald, dependent, as well as making those other folks bloody rich. Get a clue, because they are poisoning you Barbie-girl sisters the way to the bank and to wig heaven. Invest in your natural locks and inner beauty ladies. Our great-grandmothers did and were satisfied.